Will I be making a line of speakers available for the public? I get asked that question fairly often. Will I be making a line of speakers for the public? The offerings from Funk Audio are my design work. 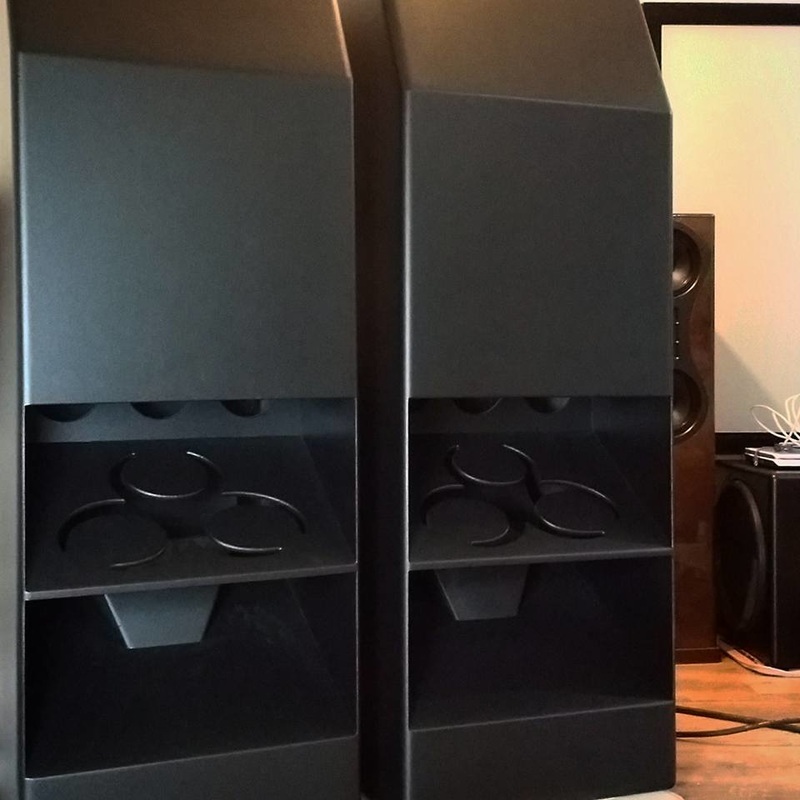 The models 8.2 and the 6.1 as well as the original design concept for the plate amps. I contributed to refining the TSAD Driver in terms ease of manufacturing and greatly improving the driver motors cooling. A nicely designed Horn Subwoofer that resembles the Orbit shifter from JTR. And it should. Becasue that was the design goal in the first place! So Yes I have designed conventional speakers. Scroll down to a New Small Horn. I have also advised on the newest model 29 soon to be released from Morrison Audio. One of the few successful omni speakers that are available. We took a great tight sounding speaker and did some more work on the upper bass lower midrange. Don is an awesome designer in his own right. I just made a few suggestions. Omer has been working with some interesting wideband designs. We have come up with a floorstander that should be a very interesting departure from the sound you normally relate to a small wideband driver. One with low end. And a punchier midbass to. That should be released fairly soon. So what do I come up with for my own line? Well I can give you a bit of information on the latest offering from K-Audio. Our first offering will be a rather unique one. It's a Concentric Horn. Designed for installed home theater applications. Very high efficiency. Enormous detail put into even coverage of the room across the whole frequency range. And efficiency akin to that of a Klipsch horn speaker. As I do not like the sound of most compression drivers I have opted for a very high efficiency low distortion planar. It's coupled to a purpose built radiation pattern matched horn. Matched in the sense that the bass and midbass sound dispersion pattern will match closely with that of the midrange and high frequency as much as is possible. This kind of performance cannot be attained with a conical or straight sided horn in the midbass upwards. This speaker setup in the link above is basically a midbass or kick horn with a planar mid tweeter and a simple waveguide. Awesome for PA use! I have measured this waveguide and found it to be pretty bad at creating an even coverage verses frequency spread. It beams. This waveguide does not have the depth to properly produce a acoustical loading for the lower end of the planars reproduction. It also lacks the proper aspect ratio to support horn loading in the higher frequency range. So you have basically a midband peak in it's horn loading. I guess that's good because a straight sided horn that is supposed to cover from bass to lower midrange will also have serious beaming peaks and valleys due to it's inherent internal reflections. Parallel sides in a horn that is supposed to operate above the midbass (80 to 120 hertz region) is not a very good design path to follow. Andy Lowe is the craftsman that created the fold and the box design. This speaker is designed specifically to fill in the region in between a horn loaded low frequency subwoofer and a main set of loudspeakers. It allows maximum efficiency in the midbass region. So basically a kick drum type of a horn. Not designed in any way to be a midrange horn. So having designed and studied many types of speakers for almost the past thirty years I have come up with a few ideas! So what can a speaker designer do? We want a pretty much spherical wavefront if we are going to have an even coverage pattern in room. Vertical and horizontal coverage. There are only a few horn types that will do that. The one I have chosen is the best. In the square profile it can still produce an almost spherical wavefront. This makes building it easier, and smaller. It is also one of the shortest types of horns for the low frequency cutoff produced. I'm pretty good at working with physics, but I can only work with them not against them! Here is a teaser of the beginning. There will be a series of YouTube videos on this loudspeaker soon enough. The frequency range covered is a solid 70 hertz to over 20 kilohertz. Just like the Klipsch Horn. Size is approximately one meter or 3 feet square with a depth of 700 mm or 24 inches. And like the Klipsch horn this speaker will have a baseline efficiency of 105db/watt. It will actually be a little higher in room. Can you say dynamic? And lower midband distortion than the Klipsch horns to! The current design is for in wall applications and will be steerable and then fixed upon proper location. There is an MTM version that is planned. As one of my friend in the industry has said. That version will be a force of Nature all on it's own. Imagine midbass and midrange in the 108db/watt or better. It could be driven from your phone! $7000 a pair delivered. Limited production per year. And there are two sets that are spoken for already. One of them is the MTM version! Wow! Super cool! You should publish your designs for Funk audio. I'd like to see your measurements on those horns and the other speakers you designed. I will indeed publish measurements of my horns. As for Nathan Funks work, if he chooses to publish frequency response curves or not that is up to him. There will be a steady update of those designs using my drivers and they will have published specs. Very detailed published specs! I meant that you should publish your design work. The things you did. Seeing your level of input would be cool from an engineering standpoint. Wait a sec. Your sim indicates a enclosure over 2 times the size of funk audios. And you have 2 drivers in parallel. His is only one. I don't call that your design. This brings into question your integrity. How do you respond? It would be an enormous disservice to Nathan Funk for me to publish a close to working simulation file of an active product. What is shown is a first draft simple horn. It was Nathan's first introduction into horn design. There are of course other versions. And they are not going to be posted.